Abstract: Anne (not real name) is from Indonesia. She was diagnosed with lymphoma and underwent eight cycles of chemotherapy. She suffered severe side effects. The treatment did not cure her. About five months after the completion of her chemotherapy, the cancer recurred. There was a 2x2x3 cm mass in her left cheek and a swelling in her left neck. The doctor asked her to go for more chemo and radiotherapy. She refused. Anne came to CA Care for herbs and changed her diet. After two months, she came back to Penang and reported that her health had improved tremendously. We then put Anne on the e-Therapy for a week. Her health improved further. Lymphoma is a disease of the lymphocytes or the white blood cells that made up the immune system of the body. There are two primary types of lymphoma. a) Hodgkin’s lymphoma (HL, also called Hodgkin’s disease). There are five subtypes of Hodgkin’s disease. b) Non-Hodgkin’s lymphoma (NHL). There are about 30 subtypes of non-Hodgkin’s lymphoma. In lymphoma, abnormal lymphocytes travel via the lymphatic system from one lymph node to the next, and sometimes to remote organs outside the lymphatic tissue (referred to as extranodal disease) (1). There are two major subtypes of lymphocytes – B lymphocytes and T lymphocytes (also referred to as B cells and T cells). A malignant transformation of either B or T cells or their subtypes resulted in a group of diseases called lymphomas. Some of the more common forms of B-cell lymphomas are: Diffuse large B-cell lymphoma (DLBCL) – this form constitutes about 33% of all non-Hodgkin lymphomas in the United States. It is a fast-growing lymphoma and can affect anyone of any age but occurs mostly in older people. Follicular lymphomas – this makes up about 14% of all lymphomas in the U.S. This is generally considered a very slow-growing lymphoma though some follicular lymphomas behave like DLBCL. B cell chronic lymphocytic leukemia / small lymphocytic lymphoma (CLL / SLL) – this is a slow-progressing disease in which the lymphoma cells are predominantly small in size (3). Some of the more common forms of T-cell lymphomas are: Precursor T-lymphoblastic lymphoma (leukemia) – a disease that can be considered either a lymphoma or leukemia. Mature or peripheral T-cell lymphomas – there are many different kinds of mature T-cell lymphomas. Mycosis fungoides (Sezary syndrome) – is a less common form of lymphoma but is an unusual one (3). Lymphomas are usually treated by a combination of chemotherapy, radiotherapy, surgery and bone marrow transplantation (2). The goal of medical therapy in lymphoma is complete remission which is not the same as cure. In remission, one may still have lymphoma cells in the body, but they are undetectable and cause no symptoms. When in remission, the lymphoma may come back or recur. The duration of remission depends on the type, stage, and grade of the lymphoma. A remission may last a few months, a few years, or may continue throughout one’s life (1). Anne (M965, not real name), from Indonesia, was 52-years old when she was diagnosed with non-Hodgkin’s Lymphoma. Her problem started in October 2009 when she felt a lump in her stomach. An ultrasound in December 2009 showed a swollen spleen. Swelling of lymph nodes at the paraaorta, both parailiac and suprapubic. The doctor suspected lymphoma. The blood test results done on 5 January 2010 showed elevated leucocyte at 23.1, elevated lymphocyte at 89 and low platelet count at 115. CA 125 was high at 221.18. 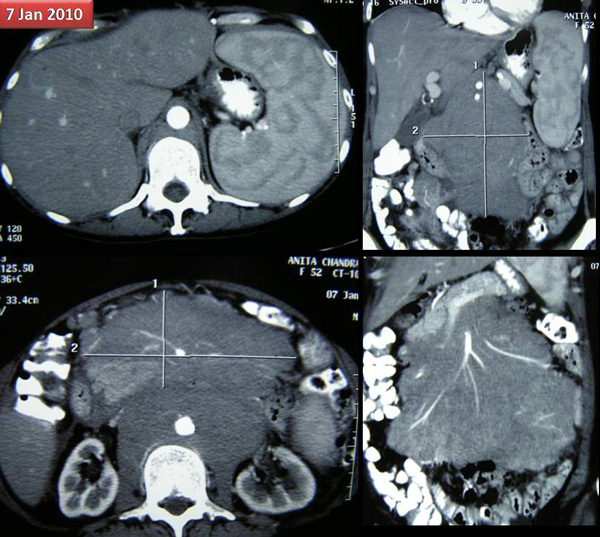 A CT scan on 7 January 2010 showed swelling of the spleen, diffusely enlarged rectroperitoneal and mesenterial lymph nodes. 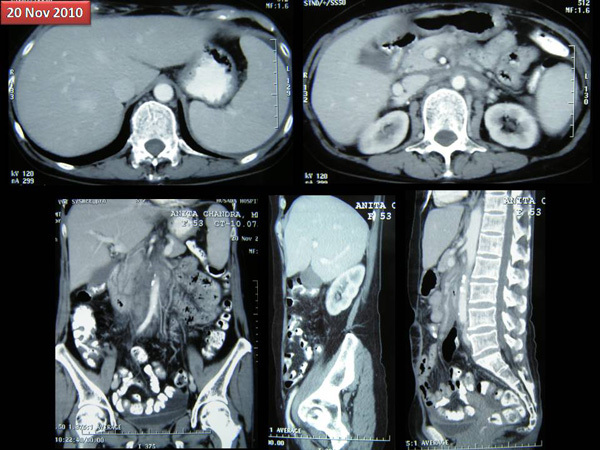 Suspicious of malignant bowel lymphoma. No ascites seen. Anne underwent a biopsy. The histopathology report dated 12 February 2010 confirmed a chronic lymphadenitis with focus follicular lymphoma, grade 1. Anne underwent 8 cycles of chemotherapy in a hospital in Jakarta. The drugs used were: Endoxan (Cyclophosphamide), Vincristine, Famorubicin (Epirubicin), Medixon (Prednisolone) , Caprol (for GERD, ulcers) and Paloxi ( prevention of acute nausea & vomiting). The total cost of her medication alone, excluding other expenses, came to about 100 million Indonesian rupiah. In February 2010 Anne suffered severe ascites. Her abdomen swelled like a nine-month pregnancy. A CT scan on 3 March 2010 (after fourth chemo cycle) showed swelling of the spleen remained stable while the lymphoma had not improved. Metastasis to the omentum was observed. There was massive ascites. Chemotherapy was continued. 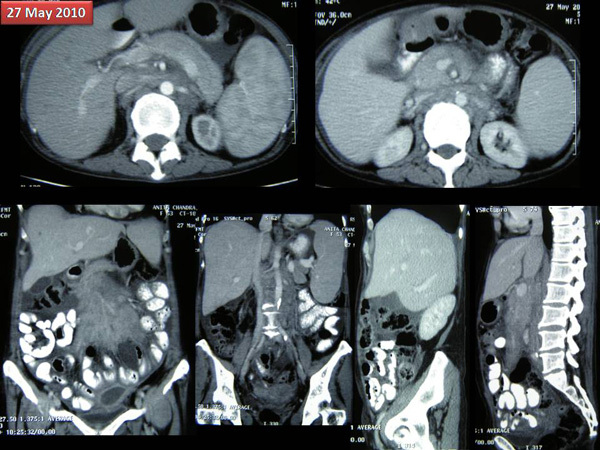 A repeat scan done on 27 May 2010 indicated significant reduction of the lymphoma and ascites. Swelling of the spleen remained the same. All treatments were completed in August 2010. 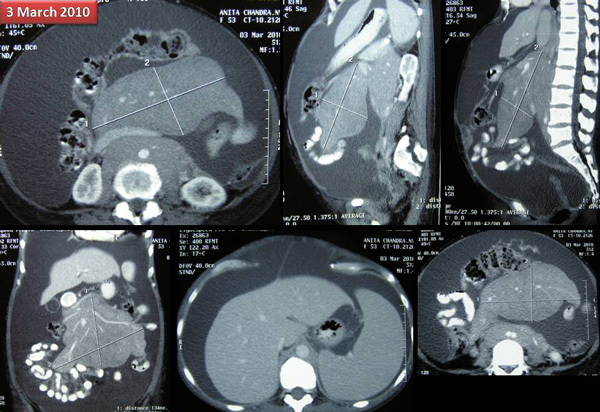 A repeat CT scan on 20 November showed no more ascites, but the lymphoma had not totally disappeared. Soon afterwards, Anne suffered swelling of the left submandubular (left side of her face around the jaw). A biopsy was performed. The report on 6 January 2011 indicated recurrence of the non-Hodgkin’s lymphoma. 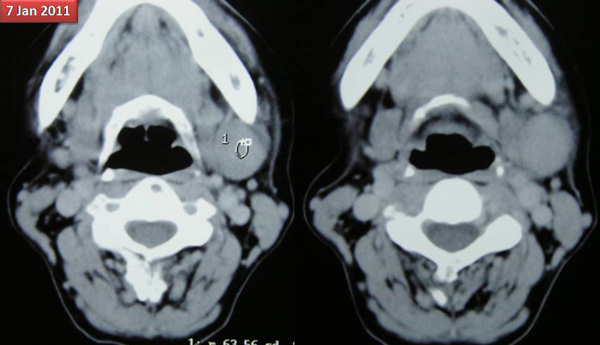 A CT scan of the submandibular was perfomed on 11 January 2011. The result showed a 2 x 2 x 3 cm mass. Anne was asked to undergo more chemo and radiotherapy. She refused – she was afraid! Watch this video and let her tell you what happened. All treatments done in Jakarta. Started with gastric problem. After the biopsy, abdomen was bloated like nine-month pregnant. She was with skin and bones. Fluid was tapped out of the abdomen – 5 to 8 tappings per day, each time about 500 ml. Tapping was done every day for about a month. Asked to do chemotherapy, at first declined but she was told: There is no choice, no other option. Chemo would not cure and the doctor could not guarantee the result. She was aware of the side effects of chemo. Suffered side effects of chemo: pain throughout the whole body, unable to sleep, unable to eat, felt very uncomfortable. After the fourth chemo, biopsy “wound” burst and discharged pus and blood. No improvement even after chemo. Abdomen felt full and difficult. After chemo only abdominal swelling resolved but she was still in pain. Unable to sleep well. Only able to lie down flat and straight, unable to turn left or right. Appetite was poor. Bowel movements difficult. Shortness of breath. Anne came to see us for the first time on 29 April 2011.She was prescribed Capsule A, C-tea, Lymphoma 1 and 2 teas. After about two months on the herbs, Anne and her husband came back to see us again of 1 July 2011. She benefited from the herbs. During this second visit, Anne underwent a week of e-Therapy in addition to taking the herbs. Her health improved further. Came to CA Care Penang for the second time after two months. When asked how long you plan to stay in Penang Anne replied: All depends on how long you (Dr. Chris) want me to be here. On 1 July 2011, Anne came back for the second time. 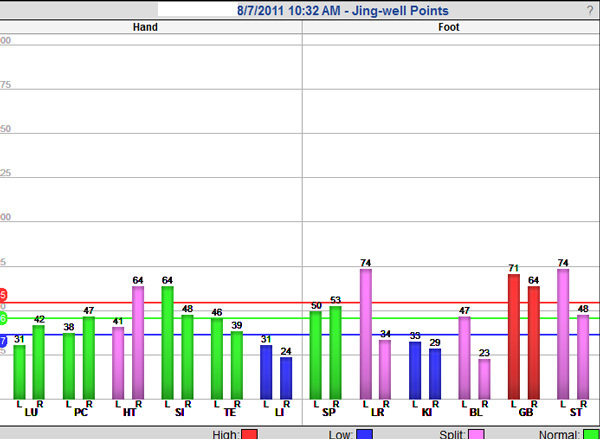 Her AcuGraph reading did not show much improvement even though she “claimed” that her health had improved tremendously after two months on herbs. Anne’s healing is beyond our expectation. In another posting we discussed what it takes for such a patient like Anne to be a winner (http://cancercaremalaysia.com/2011/07/17/cancer-what-it-takes-to-be-a-winner/). Anne came back to us after two months on herbs and a change of diet. Her health has improved. 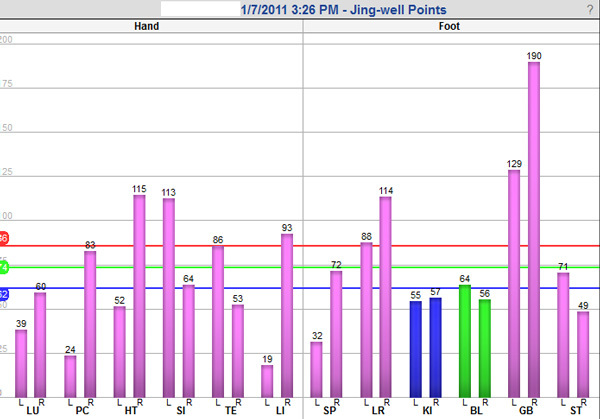 Then she received the e-Therapy for a week in Penang and her health improved further. 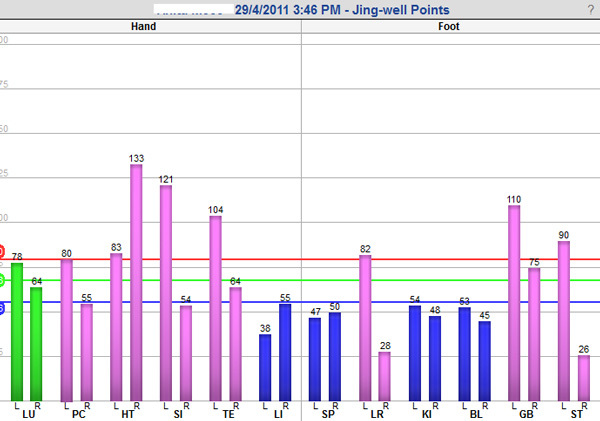 The AcuGraph readings taken before and after the e-Therapy showed her “claimed” improvements. It?s really a nice and useful piece of info. I?m glad that you shared this helpful information with us. Please keep us up to date like this. Thanks for sharing. I like the helpful information you provide in your articles. I?ll bookmark your blog and check again right here frequently. I am relatively sure I will learn lots of new stuff right here! Good luck for the next! Wow, awesome blog format! How long have you ever been running a blog for? you made running a blog glance easy. The full look of your website is great, let alone the content! It?s in point of fact a nice and helpful piece of information. I?m glad that you shared this helpful info with us. Please stay us informed like this. Thank you for sharing. Sometimes your blog is loading slowly, far better obtain a better host. Completely, it took me around Forty minutes to drag released this brilliant post. Many thanks quite a bit. Useful info. Fortunate me I found your web site by accident, and I am surprised why this coincidence didn’t took place earlier! I bookmarked it.